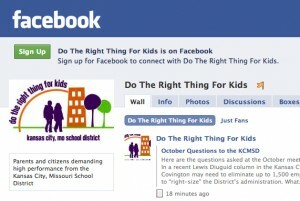 One of the primary goals of DotheRightThingforKids.org is to connect members of our community who are concerned about the fate of Kansas City’s public schools and provide the information and tools to discuss, then act to affect positive change. Our Facebook fan page and Twitter profile provide an extension of our Web site for members of our community who use those platforms. As a Facebook fan, you will receive updates to your home page whenever we update our site or the events calendar. You can post messages to the community and connect with friends. Also, we plan to post polls to help us understand the topics you think are most important, and the questions you would like to ask the Kansas City, Missouri School District. Our Twitter page is a convenient way for users to stay up-to-date with our organization and to send us (or other followers) a message.